Due to our live basketball news coverage from the FIBA World Championship for Women in the Czech Republic last week, we did not report on the matches from week 4 from the Ligue Féminine 2 (LF2). The most exciting match from week 4 brought together Dunkerque Malo and Lyon BF. Lyon ended victorious in double overtime (96-89). Dunkerque, playing at home, had the chance to win the game with two seconds to play in regulation time. Linda Bousbaa (right) was sent to the free-throw line with her team trailing by a single point. Unfortunately she missed the first shot. But she remained calm for the second free throw to take the game in overtime. It was a passionate match in which seven players picked up 5 fouls each, a total of 96 free throws were awarded. Jenny Fouasseau (left) went 4-from-8 from beyond the arc and shared the scoring title with Lorraine Lokoka with 19 points for Reims in the victory against Perpignan. Reims, playing at home, trailed by 10 points with just over eight minutes to play but were level (64-64) with Melissa Micaletto three minutes later. Lokoka then set Reims on their way with 2 points in the paint. Fouasseau delivered the final knock-out blow for Perpignan with a trey. Lyon only managed 2 shots from 21 attempts from beyond the arc. But thanks to a solid performance from Géraldine Bertal who scored 10 of the first 15 points they beat Pau Lacq Orthez (65-49). 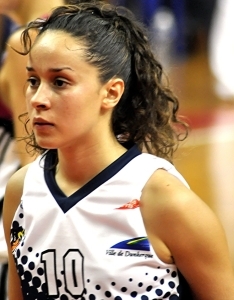 Pleyber-Christ lost their captain Aude Kernevez with less than two minutes played and also ended up losing to the CFBB (59-65). Christelle Diallo and Olivia Epoupa led the scoring with 14 and 12 points each for the CFBB in their second victory of the season. Roche Vendée remain in third place after beating Le Havre (85-49) at home. Le Havre had the better of the first 15 minutes leading (29-27). Yet the hosts finished the first half with a 21-5 run to go into the locker room leading (48-33). Dunkerque Malo recovered from their defeat in week 4 by beating Angers (68-61) with 24 points and 20 rebounds coming from Mariame Dia. Look back at the news from day 3 of the Ligue Féminine 2 (LF2).